Have you walked by a tree getting the short end of stick? Be a friend to that tree and report it. Trees in urban environments have it rough. Not only do they have to deal with getting hit by car doors, being backed up into and foot traffic, they need to withstand construction going on all around them. The Tree Act, passed in 2002, serves as a valuable accounting exercise for removal and replacement of trees. While it does nothing to address how trees are cared for if not being removed there is a DC ordinance that makes it a crime to willfully top, cut down, remove, girdle, break, wound, destroy, or in any manner injure any public tree (DC ST sec 22-3310). Before working in the public right-of-way, one needs a DDOT Public Space Permit. The terms and conditions of that permit require that: the applicant will not cut or injure trees, or pile earth or other material within 8 feet of trees, unless such trees are properly protected in a manner approved by the Director of the Department of Transportation or his representative. 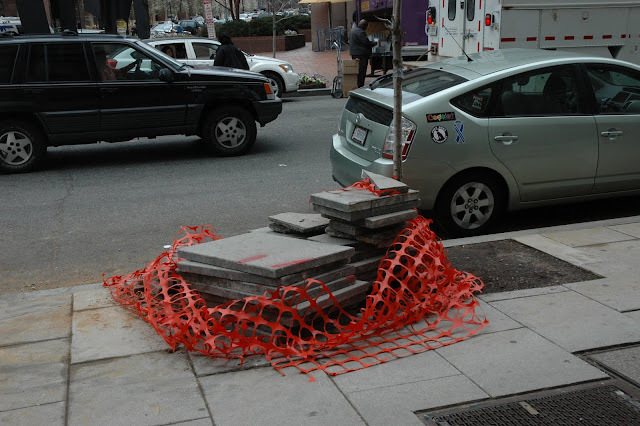 A possible violation of the terms and conditions of a contractor’s contract with DC government, if the work is being done under one, due to the stocking of material and inadequate/compromised tree protection device. Be sure to take note of where you see the possible infraction (street address or cross streets) and if possible take a picture. Put that camera phone to good use. OH MY THAT IS A NOTEWORTHY TREE.